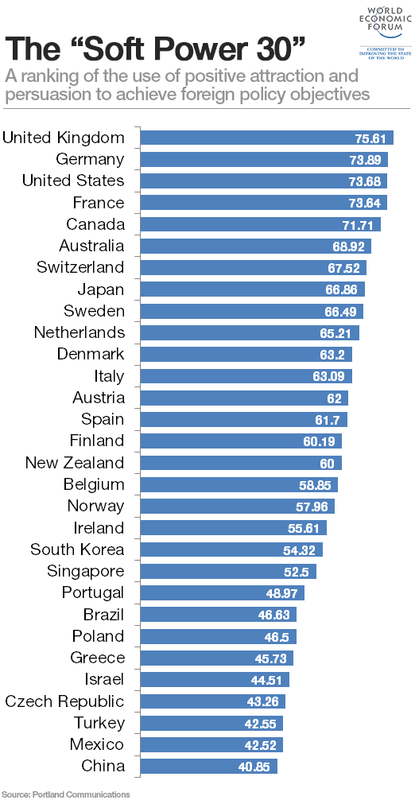 Which countries come top for ‘soft power’? The UK leads the world in ‘soft power’, according to a Portland Communications ranking, which assesses nations on six measures of reputation and influence — Government, Culture, Education, Global Engagement, Enterprise, and Digital — using data from Facebook on governments’ online impact, and from ComRes, which ran opinion polls on international perceptions of countries. The UK’s lead is based on strong showings on Culture (helped by internationally recognised pop stars and football clubs), Digital, and Global Engagement (where it ties with France for the number of overseas diplomatic missions.) Germany owes its second-place position to the highest level of trust from the global public to ‘do the right thing in foreign affairs’. The US is best for Education, Culture and Digital, but is held back by negative perceptions of American foreign policy. Despite significant investment in soft power resources, China comes in 30th. Meanwhile, Israel, which ranks 26th overall, has one of the highest scores in the Digital category. Portland isn’t the first to measure countries’ influence. Monocle magazine has run an annual survey for five years and in its most recent edition put US top followed by Germany. For more from the World Economic Forum on this subject see What are the limits to China’s soft power? and What is the next step in China’s economic leadership?